- Injury report: For the Raptors, Jonas Valanciunas (left thumb dislocation) is out. For the Rockets, Clint Capela (right thumb injury) is out. Brandon Knight (left knee soreness) and Chris Paul (left hamstring strain) are listed as questionable. - All-Star starting: Kawhi Leonard was announced as an Eastern Conference All-Star starter on Thursday. Leonard finished second in fan, media, and player voting among Eastern Conference forwards to earn the third All-Star nod of his career after previously being selected as a starter during the 2016 All-Star game in Toronto and the 2017 All-Star game in New Orleans. He joins Vince Carter, Chris Bosh, DeMar DeRozan, Kyle Lowry and Antonio Davis to become the sixth Raptors player in franchise history to earn an All-Star selection. He will be joined by Milwaukee's Giannis Antetokounmpo, Philadelphia's Joel Embiid, Boston's Kyrie Irving and host-city Charlotte's Kemba Walker as the other Eastern Conference starters. The Western Conference All-Star starters are Golden State's Stephen Curry and Kevin Durant, Houston's James Harden, Oklahoma City's Paul George and the Los Angeles Lakers' LeBron James. - Recent history: This is the first meeting between these teams this year, with the Rockets slated to come to Toronto on Mar. 5. Toronto swept the season series last year, marking the first time the Raptors had won consecutive games against Rockets since the 2005-06 season. Houston enters Friday’s game following a 114-110 road victory against the New York Knicks. After winning 11 of 12 games spanning Dec. 8 - Jan. 3, the Rockets have alternated wins and losses in each of their games since. 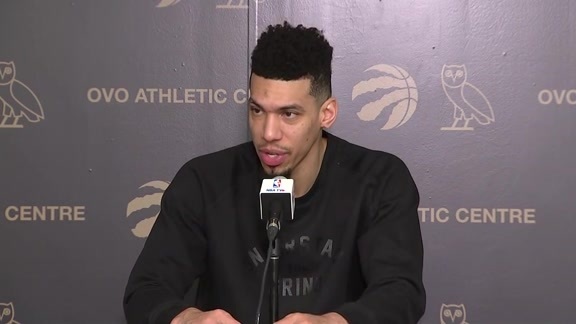 - Bounce back: The Raptors are in Houston for the second game in a three-game road trip after dropping a 110-106 decision in Indiana on Wednesday. The Raptors lost despite a 23-point, 11-rebound double-double from Serge Ibaka, and a 20-point effort from Kyle Lowry. Though the Raptors have more victories than anyone else in the NBA, they trail the Milwaukee Bucks for top spot in the Eastern Conference based on win percentage. The two teams will have their final meeting of the regular season when Toronto hosts Milwaukee at Scotiabank Arena on Jan. 31. Friday’s game against the Rockets will be a nationally-televised game in the U.S., airing on ESPN. - Rolling in the deep: While the Raptors are hoping to get back on track in Houston, the Rockets are hoping James Harden continues the ridiculous roll he’s been on. Harden, the league’s scoring leader, averaging 36.3 points per game, is coming off a career-best 61-point, 15-rebound, four-assist, five-steal performance against the New York Knicks at Madison Square Garden. The reigning MVP has scored 30 points in his last 21 games and is averaging 52.2 points over his last five games. - Understand the grind: Norman Powell scored 12 points in 20 minutes against the Pacers. He shot 4-for-9 from the floor and 3-for-6 from the three-point line while adding a rebound, two assists and a blocked shot. Powell is averaging 10.8 points on 51 percent shooting, including 43 percent shooting from deep through 12 games in January. The fourth-year guard has settled back into the swing of things nicely following a 23-game absence with a shoulder subluxation earlier this season.